What is happening to my perfect puppy? Is my dog possessed? Oh..... the adolescent dog days have hit hard. The good news for those of you who have been dedicated puppy owners and have trained and socialized your dogs appropriately you dogs may only have a speed bump to overcome. Most adolescent challenges have to deal with dog to dog interactions and so if you have helped your dog be biddable and confident it will be easier to deal with these dog adolescence. Now some of the behavior will feel like ALL around backsliding and that is where I most often get my first time calls from owners. "My puppy was just so perfect and cute and smart and wonderful and now I need help! They are lunging and barking and pulling and twirling and ignoring me and chewing, HELP!" Truth be told perfect is not really perfect, it usually means the little things did not really bother me much but these BIG things are driving me nuts. We do not start with the big things in behavior shaping we start with the little things that lead to big things. So we start with the little things, again or maybe for the first time. From perfect puppy to reactive adolescent, DO sweat the small stuff. ﻿My dog sits sometimes in the big front window and watches the world pass by, how sweet. My dog sits for many hours in the window watching the world go by and rushes the door when we have a visitor. My dog sits most of the day in the window waiting for someone to come to the door and then they rush the door barking. My dog sits by the window all the time waiting for the world to pass by and barks at everything, rushing to the door and back to the window barking and goodness gracious if we have someone knock on the door they bark and will not stop until I remove them from the door and put them in a bedroom. My dog sits in the window day and night and now barks and pulls at everything when we are on walks and pass anything or anything that passes us and acts like a fool and I am embarrassed so now I walk my dog at 4:30am to avoid the embarrassment and again at 11:30pm. My dog ate the curtains off the window and we have slobber marks 5 feet up the window and has chewed the window frame and we have peel out toenail marks on our hardwood floors, I am exhausted from getting up at 4:30am and going to bed at midnight and my dog nipped at our guest when they opened the door to the room with our dog. There is more than hope for your dog if you catch it and make changes that you stick to and you toss away the guilt and thoughts that you are a bad dog owner and stand up straight and look forward! All dogs are good dogs, sometimes they have "bad" behaviors! We can all move forward through adolescence with continued positive socialization and training and things will improve, if you do not things will get worse. Your once friendly dog may suddenly become less open to others, dogs and humans alike. As they try on their adolescent dog likes and dislikes they may also try on new behaviors to match. All of these are things your dogs might experience: being less tolerant overall, dislike puppy energy, children, men, stranger danger, loud noises, changes in the household, yellow dogs, red dogs, fuzzy dogs dogs that are bigger, smaller dogs, dogs that look like your dog, no reason at all I just do not like that dog that I liked yesterday, become hyper, rushing people, backing away from people, throwing a fit, having hyper drive for no reason in the house, escaping the yard, barking becoming shy and anxious and not listening to you. Often with an puppy who is 8 months old think we are done with the need to or desire to keep our dogs exposed to the world like we once did. The cute puppy who we wanted to show off is now just a part of our daily at home routine and we did not realize that we needed to keep them learning and growing in the world and the wonderful things we thought they loved can now become strange. We tend to take our dogs for the same walk around the same place every single day and that is just that. We need to keep them exposed even if it is only twice a week to positive social time. Giving treats when we see dogs and having people give our dogs treats. Exploring new places and new things is the key to moving to the adult good, dog happy dog way of life. We do not expect dogs to have tons of dog friends and adore all other dogs we just want them to be content, calm, well behaved dogs around other dogs. This is the age where dog parks can turn to fight rings. How much is too much and how much is too little. You are the owner who needs to constantly evaluate is my dog having fun or are they overwhelmed. If you note your dog trying to shy away from other dogs please do not continue to go to the dog park, it will escalate to bad behaviors and the chance for dog fighting. Instead find dogs your dog likes to be social with in less stressful environments. Have short play times with these dogs and always end on a positive! If your dog is the bully with loads of scuffles you need to evaluate, most male adolescent dogs have been in more than one scuffle and they are practicing and challenging confidence in other dogs. Yes, you have an obnoxious dog but not a mean, aggressive dog. You need to have a plan and that includes training. Number one do not panic! Studies have shown that dogs who get into these loud scuffles are asserting their dominance but not intending to cause harm. This is noted by the number of times the other dog is sent to the vet with injuries 5 scuffles and 0 injuries means your dog is not a dangerous dog. I know that might sound weird but the dog has bite inhibition. I am grabbing you with an open mouth and pinning you with my body but not biting you. Still not nice for other dogs and their owners but the good news is your dog is not aggressive he is just a punk. Your dog however may challenge the "wrong dog" who is going to be serious and fight back and this is why you need to address it. Must play nicely with others is always the rule. Your dog should be more interested in you and what you are doing than constantly running in circles with other dogs. You should be able to call your dog to you at ANY point and your dog returns. If not you are not being safe with your dog at the dog park. If your dog starts a fight where there is actually an injury than you have a different problem other than adolescents. KEEP YOUR MALE DOG and sometimes female dominate dogs happy and well praised for not fighting! Treats and happy voice praise with good manners. More male dogs get into serious fights than female dogs and that is just a fact. More short happy play times with fewer familiar dogs is the name of the game! This is really important for little dog owners and BIG dog owners. Keep those dogs happy to see other dog with nice short greeting and loads of praise! If you have a seriously fighting dog, one that caused harm you need to get serious help and fast. Keep the dog away from public spaces without always having a muzzle on your dog and work your behavior plan to the letter of the law with your trainer! Make sure your trainer is skilled in this area. Some things you cannot prevent, but most things you can. A friend once called to police because his house was ransacked by a thief in San Francisco. Classic movie style with everything on the floor, upturned furniture, broken lamps, paintings crooked and all! He was amazed that his dog had let them in as he was a rather large Australian Shepherd Rottweiler mix but there he was clearly stressed and a bit upset in the middle of the room of craziness. While my friend was on the phone with the local police department his dog leaped into the air off the side of the upturned chair and directly at the beam of light coming off the sideways lamp to the dragonfly that was somehow trapped inside and as it landed on the TV that had been slid to the edge of the stand so did the dog. "Sir is someone still in the house with you? Sir?" Dispatch "Yeah, can you cancel the report. I know the perpetrator." said my friend. Taking care of business while you are gone for the day is a full time job for some adolescent dogs. The once chewing puppy who was in recovery has now started up again in adolescents and now they can reach EVERYTHING! Breadboxes emptied, trash sorted, dishes in sink licked clean, counter tops checked, book covers removed, lamps dusted, laundry eaten, shoes chewed it is like a nightmare of maddening proportions. Suddenly they need MORE and we are giving them less. Anything can trigger it but you can try to prevent it by giving them frozen stuffed toys, leaving on music, extra morning exercise and a larger breakfast with more training and treats and a smaller dinner. Leaving puzzle type toys that roll and dispense food, toys that they can safely destuff, things that are okay to shred and things that you have hidden that they can find. Getting a daily dog walker to break up the day if you cannot come home at lunch for a quick meal and a big play session can save you money in the long run and most certainly your sanity right away. Do not let your dog get bored! A bored dog is a crazy dog. Just make a plan and get through the next 6 months! You need to set things up the night before so you are ready to go in the mornings. Make two kinds of frozen treats, one in a stuffed toy that is NOT easy to get out. Kibble mixed with canned pumpkin shoved into a giant kong frozen solid is a wonderful thing. Chopped veggies and a handful of kibble mixed with a spoonful of peanut butter frozen in a container to pop out into a bowl is another! My dogs all had a paper fetish, and seemly for my children's expensive textbooks! We would make little rolls of junk mail bound with a rubber band and leave those out on the coffee table for them to discover. We would much rather clean up confetti than pay for another textbook! We did this for a few months until the junk mail was always just left there on the table they finally grew out of the need to shred and more settled into being content with being home! 3. Where are your manners??? Your dog needs to constantly be reminded of what you expect form them in the manners department. If your dog lacks manners when you are home remember the above doggy destructo behaviors when you leave will surface. Practice long downs on their beds while you are home cooking dinner, watching TV or reading a book. Your dog should not be underfoot every time you turn around or try to freely move about your own house. While you have guests they should have "guest manners" the same ones your parents tried to make you have! No begging, not jumping, have a seat on your bed and relax, greet nicely, play some toss nicely then lie down on your bed again. Get your dog on a short leash in the house if need be to polish up on these skills. Bring them to their bed and say in a happy voice, "Down..... Stay" do not let them get up unless you have given them permission, you can give them a chew toy while they lie there on their bed. Do this on and off in the evenings. NO DOGS IN THE KITCHEN WHILE YOU ARE COOKING! Oaky I get that dogs are great vacuums when it comes to food falling to the floor like rolling carrot bits, but what are we teaching them? Good food comes from counter tops. I once worked with a blue-ticked hound, Getsomore (get some more) "Getty" for short. He got this name because when they brought him home he ate everything in sight and then got some more. Getty loved food, loved it so much he was a danger to himself. He tipped a pot of soup on him at 9 month old right off the gas stove! We had to work hard with him, he was fed his daily amount now in three meals, he had low cal training treats and had to learn to NOT BE IN THE KITCHEN and no begging. On your bed when people are eating their meals. Getty lost weight and quit drooling all over the dining room floor while whining like he had never been fed a day in his life. Manners are important for the safety of your dog! Practice your sits and downs and play with training words, so each toss of the ball your dog has to down and roll over then you toss. Make them say please and thank you with sits before petting or going on that walk. It is back to sweating the small stuff! Manners. They. Are. Important. WHAT TO EXPECT AFTER ADOPTING YOUR NEW DOG! You and your new dog just got home and now you need to know what to expect! Here is a really amazing 3-3-3 rule that Patricia McConnell, PHD taught me I think it is a great thing to keep in mind when you adopt! The first 3 days you new dog is in shock and transition mode. Everything about your amazing house and life will be new and different from wherever they have just come from. Most likely a quieter and slower routine. It will take time to just figure out what has happened and if in fact they are staying. During this time you are still not going to see your dogs real personality. Keep a close eye on your confused dog these first 3 days and many need to drag a leash so they don't decide to go try to hitch a ride somewhere else out of pure confusion! Get them out often to potty! Every hour when you are home and tell them to go potty outside! Your dog may sleep a lot these first few days, do not worry! Take things slow. The first 3 weeks you do is learning the new schedule and surroundings. What is for breakfast and dinner and where to eat them. Where you want them to go potty. Where the water bowl is. What your routine is and when you come and go. Learning who comes over and likes dogs and where you take them for walking. Your dog may sleep a lot or try to escape to continue to explore the new area so keep up that watchful eye! You dog may show signs of liking one person in the house and be shy with the rest. Keep your cool and do not let your feelings be hurt your dog will learn about everyone in the house one at a time. Everything is new and loud and busy or quiet and worrisome or happy and go lucky. Help your dog learn the rules faster by being clear. You should be enrolled and attending a training class so you learn how to best work with your dog. Have rules and be consistent with them. Talk to your dogs! Yay you made it!!! By 3 months your dog knows YOU are their people and what daily life is like. You now are working on continuing to train them so they can be a safe happy dog with lots of fun time outside and inside. Here is where they will be accepting of many people if introduced well and you both know how to work well together! You can now see your dogs full personality and really settle into a beautiful life together! Thank you for NOT giving up on your new dog! You both will cherish each other and have a great friendship by sticking to some easy house rules, be consistent and be involved with a great training program! ​Halloween, keep your dogs safe and kids too! 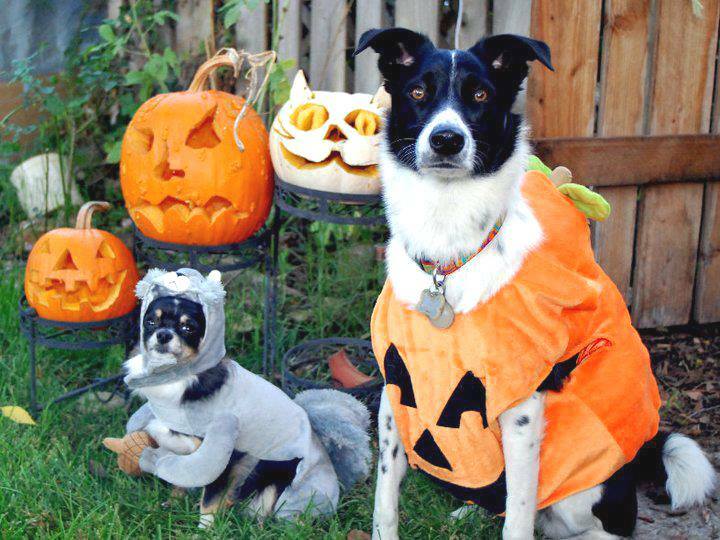 Friendly or fussy Halloween can be dangerous time for our dogs! With the chocolate candy sitting in bowls to the swinging open doors for trick-or-treaters our dogs are at risk for getting out and being poisoned! 1. Kids in costumes……. Freaky! Many dogs are not fond of kids to start with and now they are in masks and right at the front door in droves! 2. Sounds and sights of groups of people walking the neighborhood after dark can get dogs on alert! 3. Swinging the door open WIDE and gates that are left open is an invitation to go for a romp without owners! Keep kids and your dog safe! Never trust your dog to figure out that the person in a costume is someone they know and like! Be safe. Put your dog into a room with a closed door with their very own treat LIKE A YUMMY RAWHIDE OR A KONG STUFFED WITH GOOD STUFF! Leave music on to drowned out the sounds of kids coming to your door. GO CHECK ON THEM! GIVE THEM MORE TREATS AND TELL THEM “GOOD NO BARKING!” EVERY 15 MINUTES. Watch for the kids to come so they do not have to knock or ring the bell that sets your dog into barking fits. Keep candy UP high and away from your dogs!! Chocolate is poison! If your dog gets into chocolate you can induce vomiting with hydrogen peroxide. Call your vet and ask them what to watch for! If you are having a scary party KEEP YOUR DOG OUT OF IT! Keep them in nice room where you can check on them. Drunk people love to hug dogs…….. they do. Most dogs do not like to be hugged. Dogs who dislike something will bite. If your dog gets out and is with the children or you and your child comes into contact with a dog while out tell them to FREEZE! Be still and get the dog if it is yours or let the owner get the dog. At the end of the night put any leftover candy UP HIGH away from the dog. Check your gates to make sure they are closed tight. Blow out those pumpkins and call it a safe night! If you do not want kids to come to your house put a sign up at your gate! SCARY SCARED DOG INSIDE! NO CANDY AT OUR HOUSE! NO TRICK-OR-TREATERS PLEASE! 1. keep her visual at all times. Always in the same room you are in. 2. Take her out every hour on the hour when you are home and tell her "Let go outside" and then once outside say "go potty" when she goes potty say "good potty OUTSIDE! "you can even give her a treat and make it a big deal of happy potty time, Key word is OUTSIDE. When you go out for potty breaks no playing until after the go potty. Just stand there looking off into the distance. 3. Then say "lets go inside"
1. when you see her in the act clap your hands and in a big voice say, "OUTSIDE!! WE POTTY OUTSIDE" scoop her up and bring her outside, then say "Go potty outside"
you have to stay outside until she goes potty. Then give her big praise and invite her back inside. 2. Do not clean up in front of her put her outside while you clean up. 3. clean very well to get rid of any hidden smells. 4. Do not scold her if you "find" a potty, she will just find hidden places to potty. ​Keeping your senior dog happy, healthy and loved! This is the sweet Arwen a rescued dog who passed away at age 17. She is a Shepherd Husky mix of some sort and is very loving. In her younger years she loved to run and dig and roll, now she likes to nap and dig and roll. As our dogs age we need to be patient and allow them to tell us what they need which may be different than what we are giving them. They might tell you they need a quieter space to just relax, a place with a nice thick memory foam bed for their hips. Super soft beds are hard for them to get up from. They may need to go out more often to potty as their bladders age too. They need you to brush them and keep them healthy with a full blood panel to have on file to compare to as they continue to age. They need us to check their teeth to make sure they are healthy too! They need slow walks at their own pace on cool mornings and in the early evenings. They need us to adjust their food and keep them at a healthy weight. You might want to get a nice person to come let them out to potty while you are at work just like you did when they were a puppy. • They will try to please you and are super loyal so be careful how hard you push them, they might not complain that their hips hurt or have arthritis in their feet or are winded. You may only notice the next day when they struggle to get up that you pushed them to far. • Many senior dogs loose their hearing and have lowered vision. This can cause them to bite out of fear and startle responses. They can be easy to startle so make sure they see you and others coming! Clap and say their name in a sweet but loud voice. • Senior dogs get lost. They can wander and loose track of where they are and their lowered vision and hearing put them in serious risk for being hit by cars and at risk for contact with strangers and other dogs. They need more supervision from their kind owners. • Senior dogs slip and fall. They need traction and you may consider a few runners or more rugs if you have tile and hardwood floors. They trip on things and loose their ability to turn around in small spaces. Many senior dogs get stuck in places in their own yards and can injure themselves trying to free themselves up from under bushes or near fencing. • Senior dogs may bark more as loud noises might be the only noise they hear and this is cause for interest or alarm for them. Be kind and speak up tell them you hear it too but you have life under control. • They sleep more soundly. Many owners of senior dogs wake them up for fear they have stopped breathing! We stare and hover and then touch them. While you dog may pass away in their sleep it is not common. Again this is why we need a nice soft place not underfoot for them to be, they may not notice us coming and will not get out of the way. • Senior dogs are not all that into kids and puppies. You might want to provide them a nice space to be in another room so they can wander off and take a nap with the understanding that the kids or puppy is not going to follow them and pester them. • Spend time with your senior dog just being with them. Sit on the floor with them and just hang out. Let them be with you when you are doing yard work just laying in the sun or shade. Play hide the treat under a cup or two and have them play games for their mind like ring the bell for a kibble. Keep their mind active and happy! 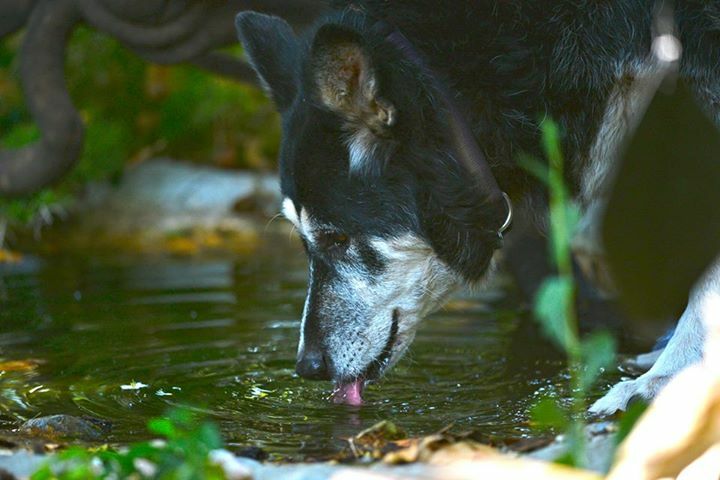 • Make sure your senior dog has plenty of water and you might want to add some canned food to their meals if you do not already. • Swimming is always a wonderful thing when you can offer it and if your dog likes it! Short swims on hot days are always a nice treat! Current free shallow swims always think safety. Some senior dogs get restless, I actually pretend there is a clinical name for it called RDS (Restless Dog Syndrome) where your dog paces or does circuits from the water bowl to the front door to their bed back to the water bowl and the front door and back to their bed. These little loops my signal they are uncomfortable, have some mild anxiety or are just not sure what to do with themselves like any bored dog. Here are some things that I have found that help. Go outside with your dog and encourage some light play, rolling the ball to your senior dog is better then throwing it as they can injure themselves with the fast take off to chase, a little goes a long way! We have these amazing balls that light up when you toss them, they are made for kids and have good texture on them like little rubber spikes and it take just a little shake and they light up. This is a wonderful toy for dogs with lowered vision. Take them on a short walk around the block. If they seem uncomfortable check in with your veterinarian about ideas for discomfort so you can do your very best to keep them happy and pain free. Thank you for loving your dear loyal friends to the bittersweet end of their short lives. Make every day a loving day for them. The trick to off leash work is the right on leash work. Some dogs are born to please and others need to be taught that you actually are telling them they need to do something. Your greatest responsibility as an owner is to keep your dog safe. I teach leash work in a manner that teaches your dogs to be off leash good listeners. The first step is to not be leash dependent owner by learning to use your voice and movement while they are on the leash. The next one is to teach your dog to listen regardless of what is in the environment and that takes hours of practice in highly moving environments. If you live in a multi-dog household separating the dogs for some practice is very helpful especially with littermates. They have had tons of puppy play together and can tune most anything out while in the throws of pouncing. Good leash work means you teach your dog to stay close and walk on loose leash by saying “stay close” and when they don’t you turn and walk the other way. This is going to take time and loads of practice. Everyday get your dog leashed up, tell them lets go and stay close, stop and sit often and give them a treat for doing so! When they move in front of you just turn and walk the other way for a few steps and turn and continue walking forward. Having dogs earn a “paycheck” while working together is also a practice piece. A paycheck can be a meal, treat, ball toss or touch and praise. Owning a dog is a lot like you have suddenly been put in charge of someone's 5 year old; they can be sweet and sometimes bratty! They are always asking "what’s in it for me?" as well as stare you down with the "Your not my real mom" stubborn look. If you say come and your dogs are having the time of their lives chasing and running and rolling in something gross, and they do return what happens next is the key to will they come again. Did you toss them in the car and drive them home, or put them in an enclosure while you left for 8 hours, or toss them in the bath... or did they get a treat with big praise "good come" and then allowed to play again, or put on the leash and walked around for a bit then to the backyard for some ball time? There are lots of ways we by accident make come a real 4-letter word for dogs that means the end of playtime. The other important part of off leash time is to consider if have they earned that amount of freedom by showing you they listen on leash without using the leash. I think about leashes as safety belts, I don’t want to use it but it is there if I need it to keep my dog safe. If my dog does not pull and responds to "stay close" commands and come commands as well as drops into a down when I say down then we move to a long line, then no line :) BUILD ON SUCCESS. Most training styles teach basic obedience and send you on your way and your dog can be at the top of the class IN class and a nightmare at home leaving you at a loss. As a behavioral trainer I teach only 3 things to the owners. 1. You are the expert of your dogs. You know them best.Give yourself lots of credit and listen to your gut. 2. How to speak so dogs listen. 3. How to use your body to have your dog respond with what you need from them in the moment. We really are only teaching dogs two things. 1) This word means do this with your body 2) Restraint (installing an override button) Teaching a dog restraint from doing dog impulsive things that their brain, breed and personality want them to do is by far harder than teaching the commands. Remember you are the expert on your dog, you know what their triggers are and what their impulses are going to be, chase a rabbit, lung at a bike, chase a car, bark at the officer, jump on someone, play with other dogs..... This is where we need to practice so we can install the right override buttons. If you own a Labrador you have a super happy, endless energy and high prey drive to chase dogs dog, however each dog is an individual and only YOU the owner knows what each of your dogs has a the top of their list as a trigger. You can also use good triggers to replace bad behaviors. Labradors also LOVE ball time so we can grab and hold their focus with a ball as well as reinforce great behavior by playing ball. A little self-control goes a long way! Knowing your dog’s personality is a big part of providing the right kind of training. We can change behavior but only modify temperament. A shy dog will always be shy, however they don’t have to be fear biters or freaked out every time someone comes near them. A social dog can be social without running across the street to say hi to everyone that they see. Behavior is shaped by what owners reinforce. Your dogs are very smart, slightly stubborn at times and like to be happy playful dogs! You have already taught them so much; this next step will be the part that helps you have dogs you can trust because they listen! 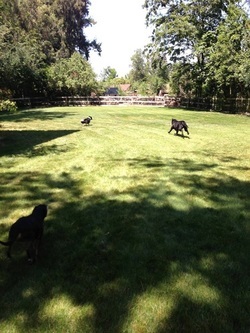 Practice off leash skills in the yard with lots of treats and praise. Toss a ball clap your hands call your dog, give them a treat and say “GOOD COME!” then toss the ball again. Do this over and over and over until the word “come” means something really fun. Play this game everyday inside or outside and your dog will come when you call them, every single time! You can mix things up and add the commands; “sit” and “wait” count to 5, and then say “Okay!” when you toss the ball. Again say come as your dog brings you back the toy. If you have not taught your dog to fetch you can use some kibble and have them sit and wait, then toss a kibble for them to find and then say “COME” and they get another kibble for returning! Remember if there are really big triggers in your dog’s environment that they have not yet mastered ignoring always be ready to keep them close and on leash while they practice. For example, if you are playing ball and your dog LOVES ball and is returning every single time but they love other dogs MORE than ball and you see dogs coming into the area you are playing, call your dog and get them back on the leash BEFORE they have a chance to not listen. This is the build on success part you need to always remember. I hope this info has been helpful. I really love dogs and have some much respect for dedicated owners. They are such amazing companions and they just need to have the behaviors that allow us to take them anywhere we can! Dogs can be social butterflies and they can be shy but the dog park might not be the best place for either of these personality types and here is why. Dog parks can be a mess of overwhelming running, leaping, slamming dogs with out to lunch owners hanging in the corners on their phones or gabbing with each other leaving the dogs under supported. Bad things can happen to good dogs fast and sometimes what happens takes months to recover from. anxiety, what they thought was happy sleepy dog was a stressed fatigued dog, what they were told was wrong and they were just trying to be good owners. Mandy was taught to be reactive by being chased and hounded by dogs at the dog park. It took 7 months to undue 2 months of dog park stress. Many dogs do not suffer as badly as Mandy did emotionally however they can learn that every single time you see a dog it means free playtime and those dogs can become reactive on leash out of frustration when they see another dog while walking. If you go to a dog park please make sure you and your dog are both happy while there. Always end on a positive and do not hesitate to leave if you do not like the energy of the group that trip, there is always tomorrow or later that day to check it out again. Have safe and happy dogs!